In this ticket manifest and other transatlantic passenger manifests that I have seen, it appears that the answers to the question "whether having a ticket to such final destination" (in column 14) are later modified by writing "S" over the previous answer. What does this "S" mean? This is a very common and frustratingly undocumented annotation on Ellis Island passenger manifests but after a thorough review, I believe I have determined the meaning. My belief is that the 'S' stands for sojourn as in a 'protracted sojourn' as opposed to 'in transit' or 'transient'. In addition to wanting to document whether a person/family had a ticket to a final destination and how much money they had, they also needed to capture whether the person/family intended an extended stay with the likely intention of becoming naturalized. This Ellis Island page has a nice overview of the years in which fields were adjusted. Records before 1897 show a column specifically for this purpose labeled, 'Transient, In Transit or intending protracted sojourn.' This appears to have been removed in 1897 in favor of a 'Whether Having a Ticket to Final Destination' column that gets a yes or no answer. Annotated in between this column and the 'By whom was passage paid column' or often atop the former was placed the mark of 'S' in question. You'll notice that groups that traveled together got a larger S covering multiple rows. Also, people with the final destination of New York or close areas are the ones to most often did not have an S. This makes sense in that they were likely visiting such areas as tourists and intended to return home versus someone with a final destination listed as somewhere in middle America that might possibly be more likely to stick around. In surveying many pages and manifests, I have definitely seen that there is no pattern related to how much money the person had, whether they had a ticket to the final destination or not and who paid for the ticket. Lastly, the intermediate pages between manifest entries around 1907 contained a page titled 'INSTRUCTIONS FOR FILLING ALIEN MANIFESTS' that describes the columns on the sheet. Unexplainably, there is a crossed off entry on some sheets that is inserted in between the columns of interest here (final destination and whether having a ticket). I was able to locate a few sheets where the cross-out pattern was very light such that I could read the text below. It reads, "Aliens coming to the United States only for a temporary sojourn, not intending to pass through in transit, should be recorded in this column as tourists by destination." I am not sure why this note was crossed off but it seems to describe the area of interest. What was occupation of Skipper in 1855 New York State Census? 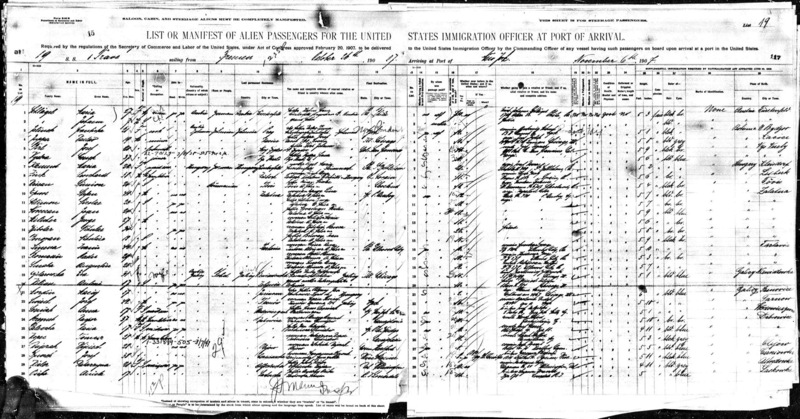 What is Ellen M Berry's relationship in this Census Record? Indexing nE census record at FamilySearch? How can I get USCIS to send me electronic results instead of paper?